Shamefully, I am writing this nearly three months after returning home from South America. Once I fell behind with blogging my trip, I never got caught up. And then, after I got home and organized all my photos, I needed a little break. I went to Mexico for a week and even got those blog posts completed. But it’s been hard to get myself back into blogging mode so I could complete writing my stories from the last few destinations in South America. So here, at last, are my adventures from Yacutinga Lodge. We flew from Buenos Aires to Cataratas del Iguazú International Airport on the morning of November 25. From there we took a van to a gas station, where we were supposed to transfer to a van operated by the lodge. But there were too many of us to fit in the van along with the other guests not on our tour, so we continued in the same van to another gas station, where we all transfered into the back of a big truck, because rains had made the roads leading to the lodge too muddy for the usual transport. We’d been riding in the van for several hours since leaving the airport, and we still had another hour or so to go to get to the lodge. We rode past farms growing mate and corn, and we rode through uncultivated jungle before arriving at the lodge by mid‐afternoon. 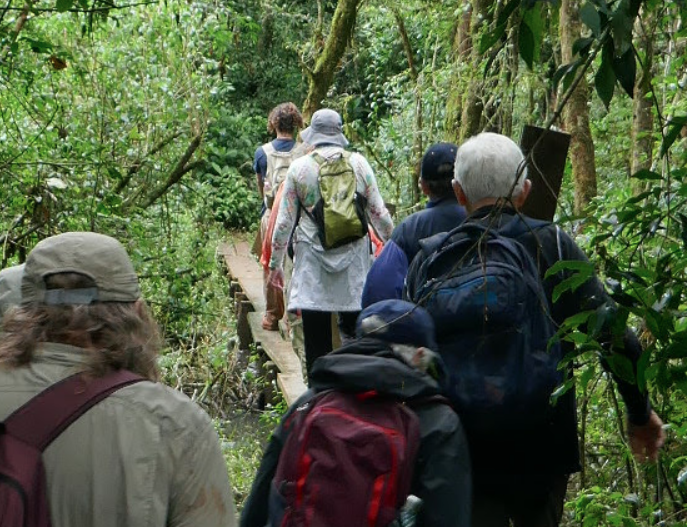 Once we were settled into our cabins, we had some free time to do whatever before the orientation talk, where the three guides, Julian, Mattias, and Marco, told us about the history and mission of Yacutinga Lodge and the ecology of the subtropical rainforest. Then was dinner, then bedtime. Food at Yacutinga, incidentally, was the best eating we did on the entire trip. They did innovative, delicious, and beautifully plated dishes for every meal, using largely local ingredients. The next morning Julian (who was the guide assigned to our group) led us on a hike to the San Francisco River, where we loaded into kayaks for a float up to the Iguazu River. It was almost not necessary to paddle, as the current took us for a gentle ride. After we landed, we started on a hike back to the lodge. We soon came to a little footbridge over a muddy creek. There were some branches alongside the planks to use as a handrail. When I took my turn to cross, I must have leaned a bit too hard on the handrail, and it snapped in half. For about three seconds I fought for my balance, and somehow, I was able to stay on the bridge and make it to the end without falling into the muck. But my heart didn’t stop racing for the remainder of the walk. Federico said I would be charged for the damage I caused to the footbridge. I’m pretty sure he was joking; they haven’t sent a bill yet! 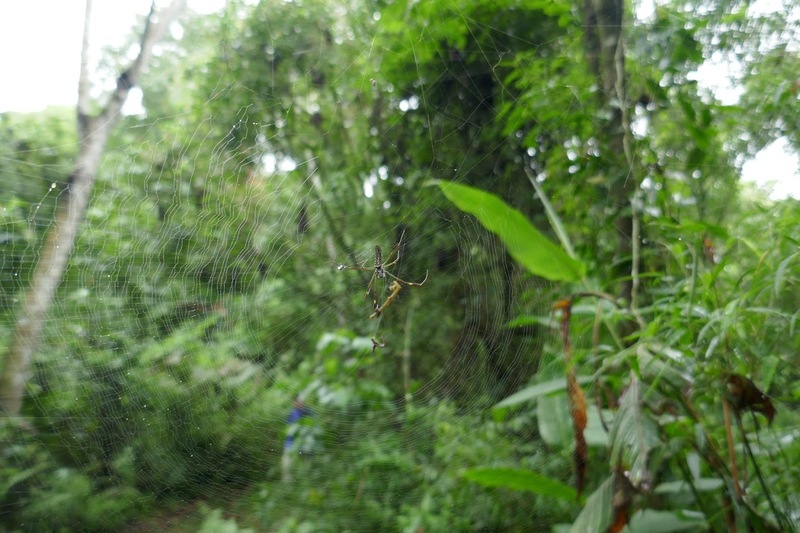 The jungle was filled with interesting flora and fauna. (Well, not so much fauna; mostly just insects and spiders.) I took plenty of photos. You can link to my album at the bottom of the page. After we got back I came across what they call a varano. After I got home, I figured out that a varano is what we call a monitor lizard. They are an introduced and invasive species in the Americas. After lunch I made this video tour of the lodge. That afternoon we set out on another hike to a nearby Guaraní village. The Guaraní are an indigenous people of Paraguay, southern Brazil, and this small corner of Argentina. They speak Guarani, which is one of the two official languages of Paraguay. We met the Guaraní chief, who told us about his people and their culture and answered our questions. We then got to listen to their choir sing several traditional songs, all of which had identical harmonies and rhythms and differed only in melody and text. I have no idea what they were singing about. After the choir finished their performance, villagers laid out some of their handcrafts. Selling their carvings and baskets and such is one of their main income sources. I bought some windchimes. Back at the lodge we got a demonstration of the cultivation and preparation of yerba mate. This was quite a bit different from the demo Federico and Ezekiel gave us at the Haneck ranch near Bariloche. They focused more on the ritual of sharing mate. This was more about how they go from harvest to cup, and the brew they made was a very different style, sweeter and more mellow than how mate is drunk in other parts of Argentina. Late that night was a scheduled jungle walk in the dark. I was one of two from our group who were feeling adventurous enough to go on the trek. So I went back to my cabin after dinner to get ready, and on the path leading to my cabin, I had a misstep. I fell and twisted the same ankle I’d previously sprained the week before the trip. I could barely walk, but I tried to limp back to the firepit to let them know I wasn’t going to be able to join the hike. Fortunately, I ran into Mary on the path and asked her to go relay the message. I hobbled back to my cabin, took some pain meds, and went to bed hoping I’d be okay the next day. I was able to walk the next morning with just a slight limp. I did my best to hide my injury from the rest of the group. To the few who noticed, I said it was an old injury and I’ve just been aggravating it with all the walking. This morning we did orchid rescue. This consisted of taking cuttings from orchids and tying them to tree trunks and limbs using thin nylon straps. Julian and Mattias demonstrate the process of orchid rescue. Incidentally, these two gentlemen were the target of much good‐natured (and some over‐the‐top) flirtation from some of the women on the trip. It’s probably not hard to see why. They we climbed (or in my case, hobbled) into the van for the drive back to the gas station, where we switched to our own van and headed across the river to Brazil. Here are my photos from Yacutinga.